Champions Chiropractic Center is proud to announce the addition of Spinal Decompression (also called Decompression Therapy or Traction Therapy) to its complement of health and recovery modalities. DTS Spinal Decompression Therapy is a leading non-surgical alternative for disc related syndromes of the lumbar and cervical spine. DTS Therapy uses simple, yet sophisticated equipment manufactured by the leading rehabilitation equipment manufacturer in the US, The Chattanooga Group. Chattanooga’s Triton DTS Decompressive Traction System is the most popular decompression system with over 1,200 installations worldwide. Do you have a herniated disc, multiple herniated discs, degenerative disc disease, facet syndrome, or any other type of spinal problem? Is your doctor suggesting surgery, Pain Management, or Physical Therapy? Have you tried Chiropractic and just could not get enough relief? Come to Champions Chiropractic Center and try out the Decompression Traction System (Triton DTS). A NEW treatment option that may help your condition! 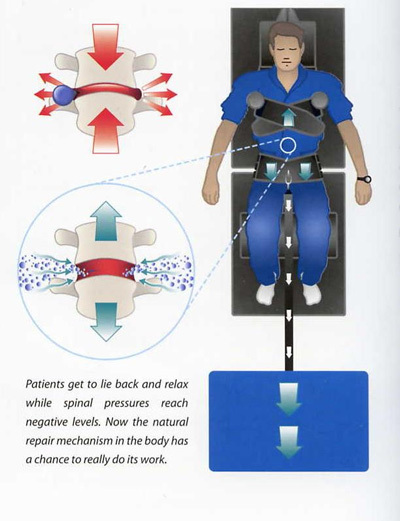 Spinal Traction is highly recommended by Neurological Research. The most recent trial sought to correlate clinical success with MRI evidence of disc repair in the annulus, nucleus, facetjoint and foramina as a result of treatment and found that reduction of disc herniation ranged between 10% and 90% depending on the number of sessions performed, while annulus patching and healing was evident in all cases. The most recent clinical study of 778 patients has showed that Disc Decompression Therapy was more than 70% successful in the treatment of herniated discs, degenerative disc disease, facet syndrome, and sciatica. In this same study, 92% of patients had a reduction in their pain of at least one point on the 0 to 5 scale(Neurological Research; Volume 20, Number 3, April 1998).